We wanted to improve the way our children communicate with each other and my Head suggested this could be achieved by doing some team building challenges. It didn’t take my mind long to turn to Taskmaster. Taskmaster is a British TV programme which has just completed its 8th series. 5 comedians are set tasks by Greg Davies (the Taskmaster) and his sidekick Alex Horne (the creator of the show) and much hilarity ensues. And so, we held Taskmaster Week. 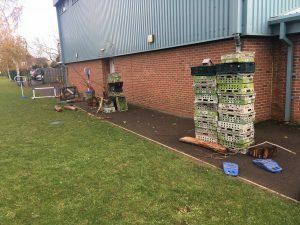 These sort of tasks appealed to me because of their random and varied nature, meaning that all children can access them and anyone could win. Those who did the best at each challenge were the ones who communicated the clearly and persevered, and sometimes they were just lucky. 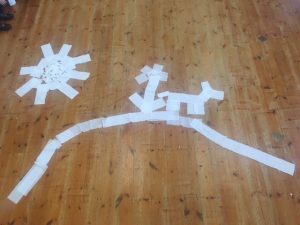 My ideas for the tasks came mostly straight from the show and the brain of Alex Horne, but they needed to adapted to make them all team tasks, suitable for children, safe and relevant to our setting. I then put them into 5 categories: Challenge Tasks which take between 5 and 30 minutes; Physical Tasks for our PE lesson; Quick Tasks to be completed in under 5 minutes; Long Term Tasks to be completed over the week and scored on the final day; and End of the Day Tasks which the children are to complete over night. What is Mr Blake-Lobb’s age in minutes? As a team, build the highest tower on the field. You have ten minutes starting from now. Make the best picture, using only this toilet roll. 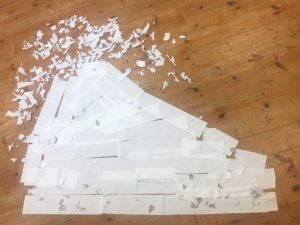 Make the best paper aeroplane. Furthest flight wins. Move the pallet as far as possible. You have 3 minutes. Go. Guess the number on Mr Blake-Lobb’s left arm. Make Mrs Rowe laugh out loud. You must not touch her. We carefully went through the rules, emphasising the need to be ready, respectful and safe at all times, then got on with the tasks. First up was a scavenger hunt, 18 items to find from all over the school. On a safeguarding note, each group had a sign out sheet, so if they left the room they had to specify where they were going. Groups had a point deduction if this was forgotten. Next the children were asked to work out my age…in minutes. They all had a go. The closest was 15 million minutes out. Some work to do in maths, but I was impressed by their attitude and approach to the challenge. They were challenged to come up with their own team name, but it had to include my year 6 colleagues favourite word. There was no way of finding out the favourite word of the teacher, so they had to guess. During lunch time, my colleague put the group names into order and point were allocated. Also over lunchtime, the children set to work on their long term tasks. Fairly quickly, one group persuades another colleague to use the word ‘bubbles’, cunningly following up another kids who got her to say ‘bubble’. They simply walked up behind and said, ‘what if their was more than one?’ A great moment, and a lesson learnt for all. The same group were able to bring me a child born on 28th May 2018. I was pleasantly surprised at how quickly they managed to do this. In the afternoon, they were challenged to learn The Highwayman poem. This, as it turns out, is more of a long term task. We’ll see if and when they get that one done. Next, blindfold drawing. Once completed, the team captains lined them up and I chose the best collections of art work. A interesting array of work, mostly landscapes, pigs, stars and a Christmas tree. I should probably collect them in and submit them for psychological analysis. The big task this afternoon was simply…build a tower. So they did. See pictures below. 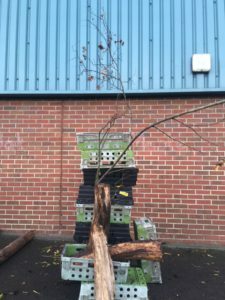 It had to be free standing, which wasn’t so easy on a rainy day, and everything had to be put back again afterwards exactly where it came from. Bonus points for the tidiest team. To end the day, the children began their diary of the week. Reflecting on what was successful or not, how they felt about the tasks, all while using a range of conjunctions obviously. Finally, I set the children their overnight task of bringing in a book to read to a younger class. Great news this morning, as most of the children remembered to bring in a book to read to a younger class. More on that later. 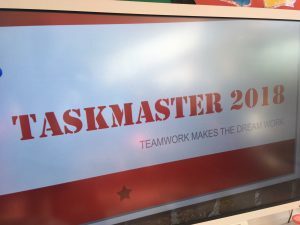 Over night we received a messaged from Taskmaster creator Alex Horne, he was interested to see what we had been up to, and explained that the real Taskmaster had agreed to give them 6 points each. This, he explained, was particularly special, as no one ever gets 6 points. A brilliant and encouraging way to kick off the day. Next up a quick task, think of the lowest unique number. I specified that it had to be a whole number, greater than 1 (as they started thinking of -48 billion or 0.000000000000001). Maybe I should have let them, but hey, the Taskmaster’s word is final. Throwing the tea bag from the greatest distance was interesting. Most just stood on the same spot for their attempt, until one girl walked up and dropped it in. ‘That’s cheating’, protested one boy. ‘Why?’ I asked. He didn’t know. Most surprisingly, this technique didn’t catch on! In the TV series, most realised that wetting the tea bag, made it easier to throw, none of the children thought of this. One did ask if they could get a new tea bag as their’s had got wet though. To be fair to them, most weren’t really that familiar with handling tea bags. ‘Guess the number on Mr Blake-Lobb’s arm’, was interesting. Most groups went for two digit numbers. One group went for 238, and got it spot on. You see, I’d written it the day before at the top of a cupboard at the back of the room. One boy noticed this, didn’t say anything, just wiped it off. This morning, I wrote the number up again, this confirmed the child’s suspicions that it was something to do with the tasks. As soon as I revealed the task, he wrote it down. Brilliant. 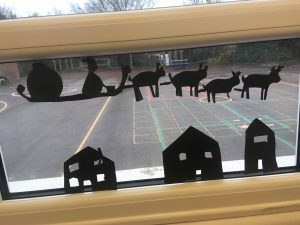 The ‘perform a nursery rhyme’ task was really interesting. While performing comes very naturally to some children, to others, it is far from their comfort zone. One group was struggling to get one member to join in. They asked me to help. So, we talked about how they could communicate positively in order to make the child, who wasn’t joining in, feel comfortable. I was really impressed and proud of how the team worked together and supported each. They come last in the task, but still got a point because they didn’t give up. They all learnt from it though. After lunch we went to visit our Reception/Year 1 class to read stories to the younger children. It was a really heart warming moment. Children in my class who struggle with self-belief and confidence, were caring, compassionate and confident with their partners. This is something we will definitely be repeating. 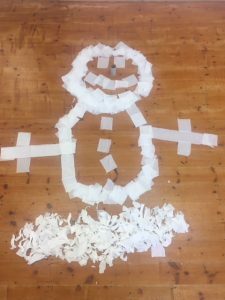 Then we made a piece of art using a toilet roll. One group was struggling, but with a small amount of guidance, were able to communicate positively with each other to resolve their disagreement and understand each others differences. I think they are starting to realise they are learning about themselves, as well as practising a variety of skills over the week. Another quick task next. Stand up for 100 seconds. They all said it was easy, until I pointed out it wasn’t meant to be an endurance task. They had to stand for exactly 100 seconds, and then sit down. We did this one group at a time, and the results we varied. All over shot the 100 seconds. Fifth place were over by 92 seconds. The closest team were over by 12 seconds. Some work on estimating time me thinks. Our final task of the day was to get an egg as high as possible, without it breaking. I insisted we did this outside as the cleaners wouldn’t thank me for getting egg on the carpet. I gave them 5 minutes to prepare, this included regular time checks and a count down from 10 to 1. Yet, I was still told by the ground who were left standing next to a tower, holding an egg, that they, ‘didn’t have enough time.’ Bizarrely, they still didn’t come last as one group put theirs in a tree. Just really low down. Lessons learnt by all. To round the day off I set the class their End of the Day task. Tomorrow they should all come to school, wearing the most unusual hats. I can’t wait to see what happens. We had a brilliant start to the day when 22 children arrived wearing an array of unusual hats. I’m not sure quite what their parents are making of all this, but we’re having a whole lot of fun in class. Today’s opening task was to make the best paper plane. Best being the one which flew the furthest. Very straightforward. Next up, ‘take the most impressive photograph’. They all went their separate ways, to different parts of the school, but all came back with pictures of themselves. The most impressive, was the group who had photo of three children performing handstands. After lunch was Taskmaster PE. The children had to do something brilliant on 2 gym mats. Perhaps unsurprisingly, most interpreted the brilliant thing as being something to do with gymnastics. I was presented with a range of flips, crabs, rolls, etc. One group though acted out a scene from a football match, with the winning goal being celebrated with a back flip. Brilliant. Then, they had to make the most impressive throw of something, into something. They could get anything they wanted, but all chose to raid the PE cupboard. Logical, given that we were in the sport’s hall. A great range of throws followed. One group held bean bags in their toes, performed a handstand and flung it at the target hoop. Unfortunately, they all missed. Impressive throwing though. The winner turned out to be a (lucky?) trick shot. They threw a basketball at a bucket, missed, bounced it off the floor and wall and then it bounced back in. Impressive or lucky? Lots more chat about positive communication and that people tend to respond better when you speak to them nicely. The ‘End of the Day’ task was to tweet a joke to our class twitter feed. Funniest wins. It dawned on me today that if much easier to be the Taskmaster, when there is a clear order of winners. When it’s subjective, it’s trickier, as their teacher, to explain why one piece of art is more creative or impressive than the another. I need to get over that, but worth considering when devising tasks. Also, the children find it much easier to grasp what is required in the tasks with a straightforward outcome (biggest, tallest, furthest, etc) rather than those tasks where they need to be more creative in their thinking. Final day tomorrow, lots to wrap up, a big range of tasks ahead, all to play for. – Doctor, doctor, I feel like a dog. – Ok, just hop up on the couch and I will take a look at you. Next each group had to nominate a group to give 5 points to. If they voted for their own group and did not win, they were deducted 5 points. 3 groups voted for one house and one group voted for themselves. Interesting discussion and reasoning took place. After that we all went outside. Each group had to join hands and kick a rugby ball the length of the field. Those that fell over or broke the link of hands had to restart. I was expecting carnage, but actually, it all went rather well. Only two groups had to restart, which was a relief as the field was quite muddy, so they didn’t get too dirty. Then I gave the children some time to complete the ‘Long Term Tasks’. All failed to surprise my colleague, which was disappointing. My Head Teacher was impressed by the maths work of one child and another’s knowledge of tectonic plates. Another colleague was made to laugh out loud by one group, made to smile by another, but not so much as a snigger was caused by the others. 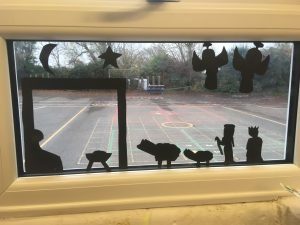 The make Christmas silhouette for the window task was a great way to get festive, well it was for the two groups who did a brilliant job of it, two had less artistic merit, while the other explained that they didn’t have enough time. This was a complaint made on two occasions by the same group even though they had the same amount of time as the other groups, and in this case, 4 days! Some made a valiant effort at learning The Highwayman poem, but if I’m honest, a 17 stanza poem might have been a bit optimistic on my part. It was based on the task of learning the names of every member of an Australian Rules Football team. I thought I’d try an link it to the curriculum and our topic. Definitely over stretched on that one. The final ‘Long Term Task’ was to write a song about the week. I will forever regret saying that they could use instruments, but there you go. Lyrically, they were pretty good, and some reflected on how they had enjoyed the week and what they had learned. The singing was pretty good as well. When they had to unveil a new handshake, I was back in the tricky place of being presented with 5 equally awesome creations and having to decide between them. The final outside task was to score a goal with a plastic bag. Tricky on a windy afternoon. Each team member had to kick the bag at least twice before scoring. One team took a football with them, discretely so others didn’t spot it, and when I said ‘go’, they popped the ball in the bag and made light work of the task. What I didn’t tell them, was that they needed the bag for the next task. They needed to make the bag as heavy as possible without it breaking. One group had a pretty large tear in their bag, but still managed over 4kg in the bag. The winning group had over 6kg. That seemed pretty good to me. The final scores were incredibly close. Sycamore 95, Maple 94, Birch 91, Oak 75 and Willow 74. I had thought about making one of the tasks to make a trophy you’d want to win. But, in the end went for a certificate. As the week went on I found it increasingly difficult to score the more subjective tasks, especially when the children all rose to the challenge and did their best. The other element that I found tricky was the timing. How long to allow for each task (this become pretty pupil led) and how long to reflect on what we’d learnt from tasks before moving on, or simply making them come thick and fast. I will definitely do this again next year, possibly during the first week of term to establish these positive relationships and considerate ways of communicating. In the mean time we will build on the successes of the week in class and look forward to the next series on TV. If you do your own Taskmaster activities in school, why not use this video from Alex Horne to introduce it? The password is schooltaskmaster. Enjoy.